Your boyfriend dumped you. You've got exams first thing in the morning. And the world's going to end a midnight unless you stop it. Looks like another all-nighter with the study group. 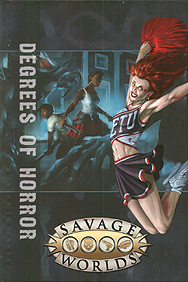 Degrees of Horror features a full-length Plot Point Campaign that takes the students from Freshman to Seniors, and uncovers a mystery as old as the faculty themselves. The syllabus includes classroom intrigue, dark conspiracy, dusty mysteries from the past, killer exams, massive parties, and new horrors to torment the student body.